Do You Want To Plan Your Way To A Six Figure Income? Would You Spend $39 In A Tool That Will Help You To Manage And Improve Your Online Business? ...then you know what I mean when I say, “micro managing”. It is an average day in the life of an online marketer to close your laptop and wistfully glance at all the fallen strands of hair on your keyboard; internet marketing is fun and innovative but it has its share of stress. People get confused, frustrated and sometimes, overwhelmed by the sheer volume of everything that they have to get done. They fail to plan and their six figure income becomes another hair loss story. Do you know why I think you’re failing? Big corporations, even those whose activities are online based, have executives, they have CEO’s, they have paper boys, they have personal assistants and they have interns assisting those personal assistants ... if you’re lucky, all you have is your outsourced team and a nephew/niece who doesn’t mind being paid minimum wage. Despite not having a full time staff, you can still make substantial progress. You can compliment your day job and you can very well be on your way to being a fulltime internet marketer. But what if you can’t take your business to the next level? What if you can’t take your business to any level? Actually, you can if you make smart decisions, utilize proper resources and PLAN! Planned strategies are better strategies. So what does an Internet marketer’s battle field plan look like? Fellow dot com life stylists, that is a screenshot showing the MSD Organizer doing its thing. 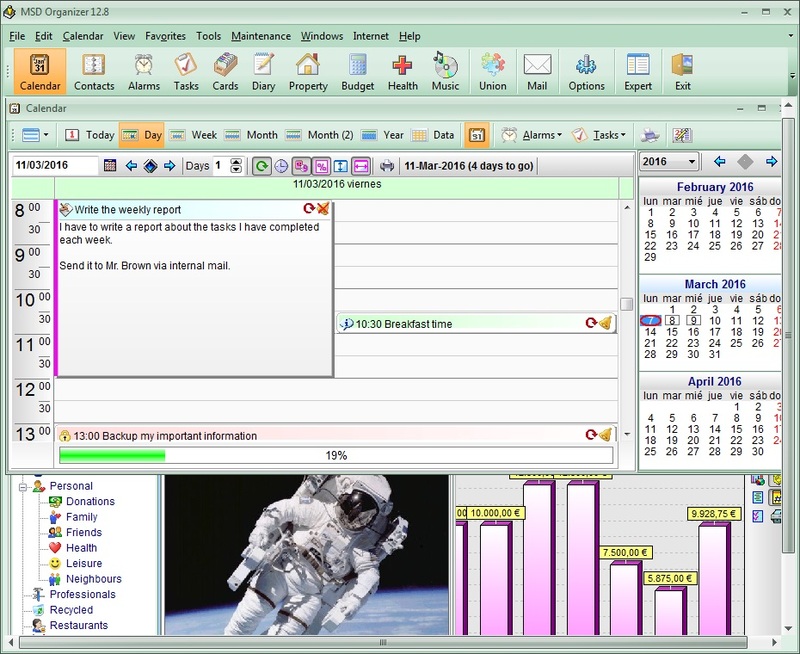 The MSD Organizer is a simple Windows based organizing software, jam packed with features that will make your life a whole lot easier! I know that even my grandmother’s cell phone has a calendar and an alarm application and there is no use for a product simply combining the two features. So how is MSD Organizer different from my grandmother’s cell phone? The software is made up of different modules or sections with each of them having a different functionality. 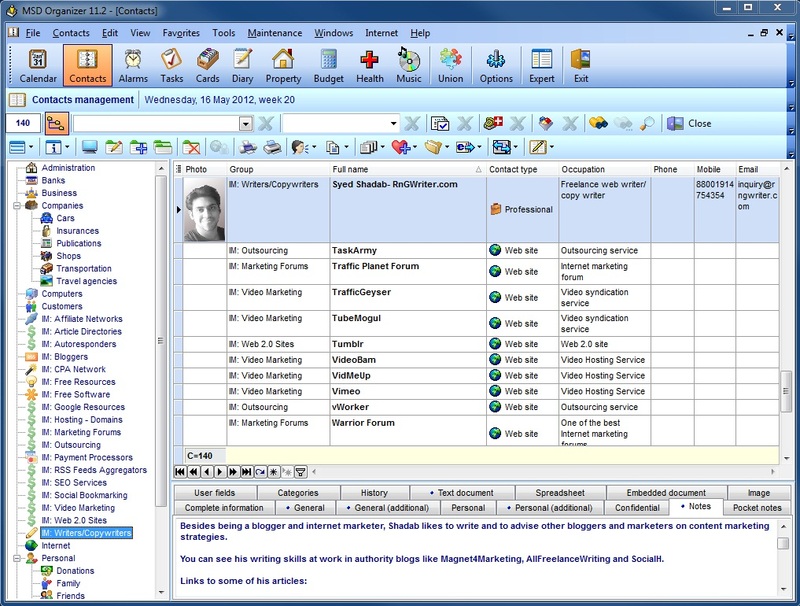 Manage all your personal and business contacts from a single interface. Record all your correspondence with clients, workers, business partners and JV partners in real time and run a more efficient business. Store sensitive information like passwords and usernames in secure databases within the software. Carry the software in a flash drive and access all your information from any computer, safely. Create business reports, financial statements and word documents using the software for easy exporting and fast publishing. Add Alarms for all the important tasks that you cannot forget. Add Task records to create and manage projects. Keep track of progress and employee performance. 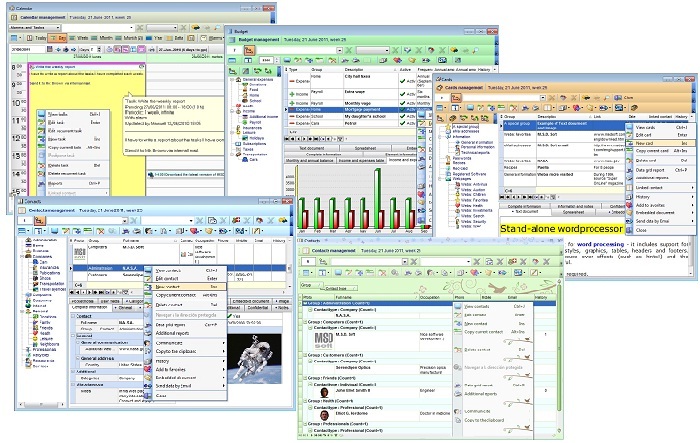 Fully customizable software interface. Using simple styling options, you can give the software window your look! Search and find any contact, email, copy, invoice or receipt in a matter of seconds regardless of the amount of information you store! ...and SO many more. I don’t think there is any marketing activity or campaign that the MSD Organizer won’t help you manage! Download MSD Organizer free demo today so see exactly what I mean! What system requirements does MSD Organizer have? It will function on any Windows Operating Platform. Do I Need To Renew My License After Purchase? No. A single lifetime license is included with every package. Free support is provided for all software. Can I install this software on a portable hard drive? Yes. You can access passwords and other sensitive information via the MSD Organizer on any computer with an internet connection. Do I really need this software to make money online? This product offers a lot of potential to people who has to micro manage their business, juggle between two jobs and balance their personal life with their work life. With a lifetime purchase of a MSD Organizer license, worth only $39, you will be receiving video tutorials and ebooks worth over $200! Continue reading to find out more. Contact Module: This module operates like an address book within the software. You can add contacts, their names, websites, personal addresses business addresses and contact information. You can add documents. You can add pictures, notes and even spread sheets to a person’s contact information! Apart from spreadsheets you can also add other documents like charts, word documents, power point presentations and PDF files. Do you realize how useful this can be when it comes to keeping track of your workers, their progress, their performances and the amounts you owe them? When it comes to keeping track of your JV partners? Within the contact module you can categorize your contacts by adding groups. You can add as many groups as you like and delete them when necessary. This feature is ideal for balancing your personal life with your professional life. You can set up a group for prospects and embed things like your mail copy. Simple copy-pasting of the same copy will boost your email marketing efforts. Affiliates can use the contact feature of the MSD Organizer to keep track of all the programs they are promoting and all the web services they are using. History Module: You Would Pay Hundreds of Dollars for this module only!!! This will be your secret tool in your marketing efforts. Just keep reading. The history module consists of a database that is associated with every module within the MSD Organizer. Meaning, after creating a new contact, you can use the history feature to record all your correspondence with that particular contact. You can record emails, invoices, receipts, subscriptions, notifications etc. This is extremely beneficial when you are contacting a lot of people (clients, bloggers, webmasters, freelancers etc) on a daily basis and find it difficult to keep track. For every email you send out, you can make a note in your contact module and record the email in your history module. You can paste the follow up emails and record your progress. You can efficiently manage even the biggest campaigns this way and the best part is that when you contact that same person again, you can refer to your previous relationship. The same benefits will apply for providing customer support or for answering your prospect’s queries. The history module is invaluable for building long term business relationships that oozes with professional credibility and trust. You can also utilize available resources simply by storing them! Confidential Features: Between forums, hosting accounts and other web services, you are likely to have a lot of accounts all over the internet. That’s a lot of usernames and passwords to remember. Not only can the MSD Organizer generate strong passwords, it can also store the passwords and usernames for a given site. This feature ties into your contact database i.e. for any given contact whether that be of a forum or for Google Analytics, you can link their login page to your username and password. So the next time you want to log in to your Google Webmasters account, all you have to is click the “Protected Sites” dialogue box, select Google Webmasters and simply copy and paste your user name and password! All your passwords are stored in an encrypted database protected by a single password. With MSD Organizer, you only have to remember one password to have access to all other secure information. Portability: One of the most awesome feature is that the MSD Organizer is completely mobile; meaning you can install it on a flash drive with all your information and access your information from any computer. Meaning with the “Protected Sites” feature you can visit protected sites from any computer, enter sensitive information and not have to worry about security! Alarms: In coalition with the Alarm module, you can use the history module to access to all other information you store. For example, you can create an Alarm item to buy a web hosting package but you will be able to access your old forgotten coupon code in the history module! The practical applications are endless in the hands of a busy marketer. Tasks: You can set up and schedule Tasks that need to be completed. You can use the Contact module and integrate your Task description with the information of all your associates. You can set up alarm and record your progress using the best organizer software, MSD Organizer. Budget: You can manage both your personal and business finances with the MSD Organizer. Set up simple spreadsheets and export them as reports to be emailed or printed. Set up periodical balance sheets and graphs and categorize your different sources of income and expenses. With the MSD Organizer, never again do you have to worry about doing your taxes! Make planned presentations to clients and budget your outsourcing more efficiently. Do you like what you are hearing? Then download the demo version for free! You can get the 30 day trial version without entering your email address or any other kind of contact information! You can upgrade or uninstall at any time. Download your free version by clicking here. If you can play solitaire, you can install the MSD Organizer. After downloading the 9 MB installation program, all you have to do is click the .exe file, hit “Run”, the usual “Next”, “I agree” and “Finish”- your done! The same process applies for both the demo and the licensed version. Demo versions can be upgraded easily, within a matter of seconds. By referring to the detailed user manual, you can learn everything there is to learn about the different features of this software in a matter of minutes! BUY NOW TO GET OVER $200 worth of bonus material. I know that it is fruitless to sell something to a marketing veteran and not offer a little something extra. Bonus: Top Secrets and Strategies of Super Affiliate Marketers. An interesting 42 minutes video explaining what markeging gurus do to make big money online. Bonus: Magical Recipe for Making Money Online. This pdf ebook contains 92 pages of pure gold for starting making money online. It explains the whole process crystal clear and also provides useful marketing resources. Bonus: List Building from Scratch. This pdf ebook contains 45 pages with step by step instructions for list building and monetization. As you already know, you must build a list of subscribers if you want to make serious money online. Learn from this ebook and take action. Bonus: Mobile Marketing Magnet. This video course contains six videos that will show you how to bring traffic to your mobile sites and how to monetize them. Bonus: Joint Venture Revealed. This pdf ebook reveals how you could easily build strategic alliances to skyrocketing your business sales and profits for long term. Bonus: Content Chronicles. This pdf ebook provides a writer's insight on things related to quality content: Article Marketing, Guest Blogging and Social Media. Biggest Bonus: Short Cut To The Best IM Resources. Remember how the MSD Organizer has a contact database? Well, as a special limited time offer, you are going to have access to our very own personal internet marketing address book. We are giving away a contact database that has over a 140 prelisted contacts. Everything from recommended SEO tools to web hosting providers! You can add and edit this database as you wish. After your purchase, you will be sent the program file which you can easily import into the MSD Organizer. With over 15 categories and 140 contacts, buying the MSD Organizer is a sure short cut to finding the best internet marketing resources. Final Bonus: Free Updates and Customer Support. A deal breaking 20% discount coupon code, valid on all your future purchases of MSD Soft products. Planning your campaigns, marketing activities, and managing them more efficiently enables you to run a cost effective business where things will never go haywire. Looking forward to seeing you on the other side! Hopefully, with healthy hair! Try MSD Organizer for FREE: Download MSD Organizer, install it with confidence, since our software is respectful with your computer, and try it for Free. Enter your Contact Information: once you are convinced that MSD Organizer is good for you, press the "Add To Cart" button and fill out the registration form (we will use this information for the invoice). Pay using Paypal Secure Payment Services (Paypal, Credit Card or Money Transfer). The purchase process is completely safe. This offer is not for serial refunders, only for honest Internet Marketers that want to improve their marketing experience. Paypal is aware that our software can be tried for free before purchase. Download MSD Organizer for Marketers and all the bonuses: just after the payment process has finished, you will be directed to a webpage where you will be able to download the Lifetime License of MSD Organizer and all the bonuses of this offer.